Ridge reinforced Walls and Wide double doors. Simple and quick assemble with pre-cut and pre-drilled parts. 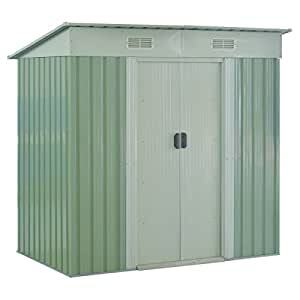 Made from electro galvanized steel make sure the shed sturdy, rigid and durable. One Year Warranty. We offer you 100% risk-free satisfaction guarantee to let you buy with confidence. We are quite sure that you will be super-impressed with DURABILITY and HIGH QUALITY of our storage shed. This is our 4x 6.2ft outdoor garden shed which is ideal for a variety of storage needs such as toys, garden tools, seasonal decorations or other spare belongings. Equipped with two sliding doors and four ventilation windows placed high, it ensures security and adequate ventilation. It is made of color plate and electro galvanized sheet for corrosion resistance and it can be expected to use for long time. No-hassle assembly and easy access to belongings make outdoor storage convenient and safe. Don’t hesitate, Just buy one!